I am sitting in the very last session of this year’s Future Insights Live web development/design conference in Las Vegas. The speaker just put up a slide that says “Stop Building Web Applications.” Seemingly radical phrases like this have been the norm this week as the presenters try to get the crowd’s attention and get their point across in a quick and simple way. In this particular case, he simply is trying to say that we need to build applications that can run on anything…not just the web. To echo something I heard several times during speeches at the conference, I digress. The purpose of this article is to outline exactly what it is that I won…and win big I did. As I mentioned previously, I don’t gamble, and yet I came away from Vegas this time with far more than I went there with. Crazy, huh? Is it obvious that I’m leaning towards a sappy sort of “I came away with a ton of priceless knowledge” angle yet? If not, go back a few paragraphs to the gold mine thing. I wasn’t actually talking about gold. I learned a lot…I learned a TON. Too much to retain. In fact, I’ve forgotten a lot of it already; that was inevitable though. Fortunately there are slides available on a SkyDrive account the FILive people made available to us (brilliant idea guys!) and I took a lot of notes, and tweeted a heck of a lot of tasty tidbits, as did a lot of others. So all of it is there to be retrieved as I need. There is also the social aspect I mentioned. I was able to connect to so many people that are literal founts of knowledge via Twitter and Linkedin and email that discussing these things with them in the future is a very real possibility. The thing that blows my mind even more though, is that more than once people asked me for my contact information because they wanted to be able to use me as a resource! 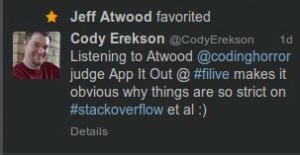 Jeff Atwood (@codinghorror) the co-founder of Stack Overflow and Stack Exchange favorited one of my tweets! I officially leveled up in geekiness when that happened. 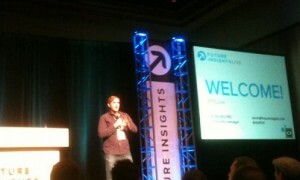 I came away with Future Insights Live with my head full of ideas. Numerous times the presenters asked us to share ideas that we’ve had with them. Typically at the time I did not have anything to say since those ideas were just beginning to percolate. Even now, as I finish writing this a few days later, many of those ideas have grown and expanded considerably, yet are only fragments of what they will inevitably become. Once I take these idea seeds to the real dreamers and imagination people I work and play with and see what they grow and expand into, the real fun will begin! Oh, and I won an iPad. Sort of a footnote to this whole thing….maybe someone else would have made that the headline; I honestly consider that to be the least valuable of what I have taken away. That is not because of the fact that it is an Apple product, and we know where I stand on the Apple/Android aisle; I would have the same opinion if it was a Nexus 10. Winning it was incredible, I was surprised beyond belief and I am very grateful to Davin and everyone else at Future Insights for the iPad; the way in which they gave it away was really neat….they asked everyone to tweet something they had learned so far. Watching those tweets all day was way cool, and the best part of that whole competition! 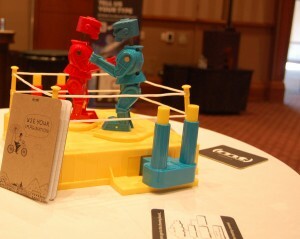 What did I actually win at Future Insights Live? I won a LOT of time spent updating and fixing code.